I wanted to support small business on this day while picking up a few gifts, and lots of things for myself too, of course. Our first stop was the old Amish Store for some canned good gifts and bottled Sarsaparilla Tea for J. 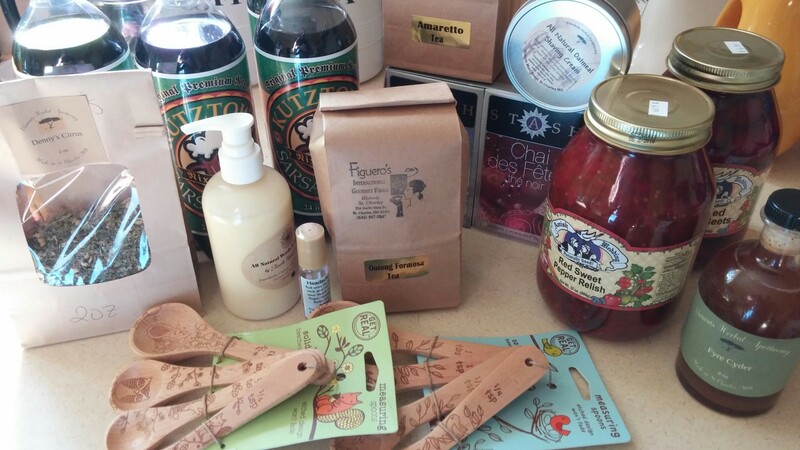 Then we hit a new spice/tea shop and ended up with headache essential oil, weed lotion, oatmeal shaving cream, citrus tea, something called Fyre cyder, and the wooden measuring spoons which are gifts. Last stop was another tea shop where I got some Christmas teas for myself, and some loose leaf Oolong for J and loose leaf Amaretto tea for me. More pics from old St. Charles tomorrow. For now, we are all shopped out. How was your holiday weekend? Did you shop? If so, where? And what did you buy? When I was married, I tried to like tea because my ex liked it, but the only kind i really like is China Black. Coffee, however, is another matter! As for shopping, new puppy got all the goodies: big bag of special puppy food, a big bag of puppy chews, and two new squeak toys. Tea is definitely one of those that you either love or hate. We are huge coffee drinkers too and consume more of it on a daily basis than we do tea year round. In the summer, it’s mostly cold tea. I love hot tea in the winter though. Our pups got new toys too! One of which has already been destroyed. They must not have liked it. The older one only chews up the ones he doesn’t seem to care about. It’s the cheap $1 squeaky plush balls that survive the pick.